Eizelle Eats Out : Cookbook Tuesday! Aww schucks friends, it's Cookbook Tuesday! 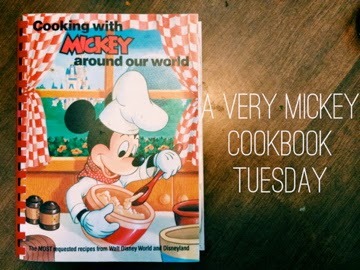 Today I show you one of the only Disney cookbooks I have in my collection, Cooking with Mickey Around the World. 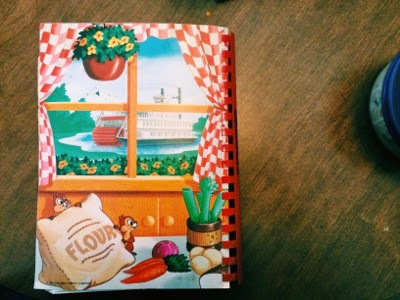 It may look cute on the outside but there are some pretty advanced level recipes. This book is not for the kiddies. Mickey is in chef's whites so you know he means business. 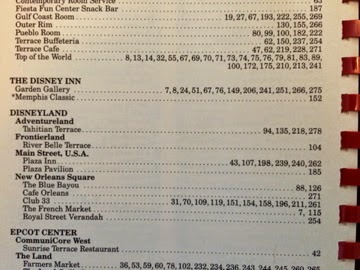 The book goes though all the Disney Parks as of 1987 and details the fan favorites from each park and separates them by section. 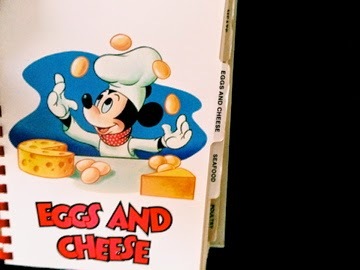 As someone who has never really eaten a dinner in the park that is not Mickey head nuggets or a turkey leg, I don't have an emotional connection to any of the recipes. But the pictures are pretty fun and a quick glance will reveal that these recipes are pretty legit and worth a try. The fun section is the beverage section most of them contain alcohol. There isn't really anything special other than the the pictures on the dividers. 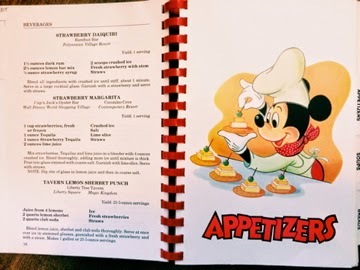 There are no photo examples for the recipes and Mickey only shows up at the divider section. I mean Mickey just caught this fish with his bare hands! But I think the best part about this page is the recipe for Scotch Eggs on the opposite side of the picture. 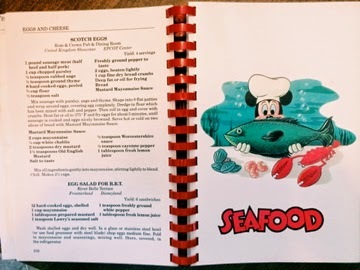 A strange addition to the book were the elusive Club 33 recipes. Most people haven't eaten there at all and will probably go a lifetime without eating there. But I guess if you make said items, bring it to Disneyland and stand right outside the door, it is probably the same as eating at Club 33. Probably not, but one can dream! Right? Sadly no recipe for churros or Wetzel's Pretzel. What are your fav Disneyland foods? Turkey leg is a must for me every time I go. I haven't had these but I heard they have fried pickles. What what?